Kick off your HR West conference with a PHRca® Prep course! Add this California Certification to your HR career portfolio with the Professional in Human Resources – California® (PHRca®) from HR Certification Institute® (HRCI®). The PHRca demonstrates your mastery of the laws, regulations and HR management practices unique to the state of California. The PHRca is for professionals who either practice in California or are responsible for human resource management in California. You do not have to be based in California to earn a PHRca and you do not need to have any other certifications to qualify to take the PHRca. 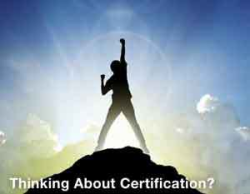 Many certification holders add the PHRca to their other HRCI credentials. Upon completion of this course, you will be prepared to sit for the PHRca exam during the convenient open testing window at locations across the country. Class Location: This facilitator-led class will be held at the Oakland Marriott Convention Center prior to HR West. Come in early and enjoy the Marriott while advancing your credentials. See our Hotel & Travel page to book your extra nights at the Marriott. Register Online at nchra.org by 3/1/2019 or click here for more information. •	California Chamber of Commerce Publication, HR Quick Guide for California Employers. Receive a member discount on your registration when you register today. If you are not a member, select the Join Now rate to register for the course and receive a 1-year NCHRA membership. There are so many reasons to join today and start saving - beginning today with this course registration! J.D. Sanders holds his Master’s in Education, as well as his SHRM-SCP, SPHR, & PHRca Certifications. He played a key role in the development and launch of HRCI's California HR Certification Program in 2007. He is the founder of J.D. Sanders Consulting and has over 20 years of HR experience, including senior HR positions at Silicon Graphics, Irwin Home Equity and Lam Research. His dedication and passion for HR is exemplified by his volunteer service as a past member of the NCHRA Governing Board, the Santa Clara Regional Board and the Certification Advisory Committee. J.D. is one of our most highly rated, knowledgeable certification instructors. Click here to visit our Certification page to learn more about minimum qualifications and the testing process.